You are currently browsing the category archive for the ‘silver’ category. Picture taken in sunlight. This is really a polish that’s meant to be layered, as it’s not that dense of a glitter, but with some work it can be opaque on its own. I didn’t really paint this on like a normal polish; I put a lot of glitter on the nail then spread it around, then let that initial “coat” dry a little, then filled in any empty spots with more glitter. I also moved the glitter around with a cuticle stick to get nice, even lines. When you look at this close up, you can see all the different colors of glitter: silver, fuchsia, sky blue, green, orange, yellow. But from a distance, the silver really dominates. Next time I use this I’ll probably put it over black to make all those colors pop, but I just wanted to see what this sort of “party in a bottle” glitter would look like on its own. I paired this with OPI Metallic 4 Life on my toes. Picture taken in weak sunlight. (Pardon the tip pull, I had to take this on the second day of wear.) The formula was not too thick and applied well in three coats. Just one coat of topcoat leaves it relatively smooth. (Not totally glassy smooth, but definitely not rough.) While pretty, plain silver glitters tend to look the same after you try a couple, so I love the addition of the multicolored glitter. It’s slightly larger and different-shaped, so it really pops against the silver. 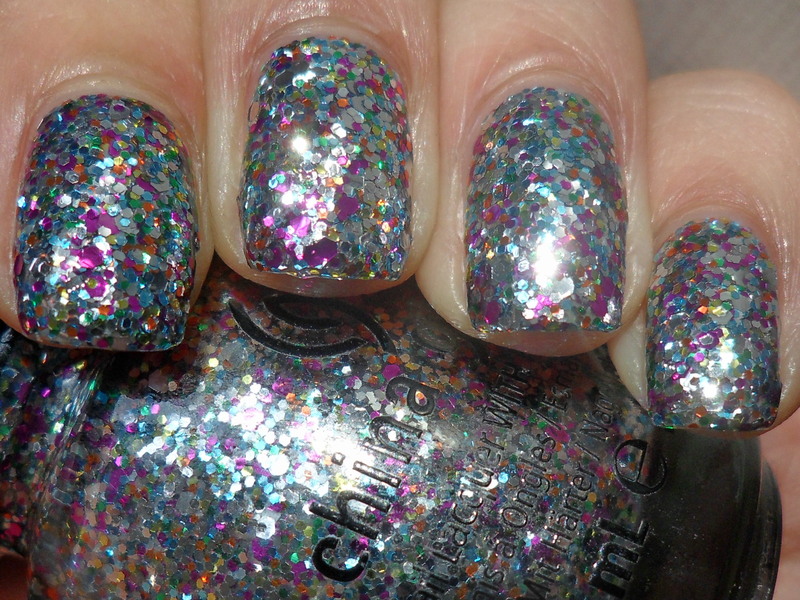 I don’t normally think of putting cold, silver glitter with cute, sweet multicolored glitter, but it totally works. “Futuristic birthday cake” comes to mind. 🙂 I paired this with Sally Hansen Opulent Cloud (HD) on my toes. Picture taken in sunlight. This applied well, pretty smoothly for a glitter, but it does tend to thicken up as you work with it, as is usually the case with clear-based glitters. Since the glitter is very fine and absolutely loaded into the base, I got full coverage in just two coats. It dries a little flat, so topcoat really brings out the depth of finish. I think one coat is enough to get a relatively smooth surface. The sunlight brings out the champagne color, but in low light it pretty much just looks silver. And of course, it sparkles like crazy! I catch myself staring at my nails because it glitters with every move. It truly does look like I’m wearing crushed-up diamonds! It’s very glitzy and glamorous. I paired this with China Glaze First Class Ticket on my toes. Picture taken in sunlight. This applied well, though due to its slight sheerness I needed three coats for full opacity. The finish is incredibly reflective; I had a hard time getting a shot without too much glare! The shade of silver is so light and bright that it practically has a white-hot glow. The copper microglitter is definitely visible, but probably not at a quick glance. It breaks up the monotony of the silver and gives some warmth to the overall tone. I love the finish! The sparkle is delicate because the microglitter particles are tiny, but really intense since the base is loaded with them. I paired this with Barielle Falling Star on my toes. Picture taken in sunlight. (The silver may look darker here than in real life, but I just had to pick a photo with the least amount of glare. And view this in full size!) The glitter is relatively fine for a glitterbomb, so the formula actually went on really smoothly. I was expecting to do three coats like usual but I was able to get away with just two, since the glitter is dense. I was both surprised and glad for that since I avoided having to do a really thick mani. Even though I don’t usually wear polishes for more than three days, I can imagine this would hold up well since it’s a relatively thin glitter mani. With a single coat of Poshe the surface doesn’t turn out completely glassy smooth, but far from rough or bumpy. This is predominantly silver and the fuchsia is just barely sprinkled in there, but even in such a small amount it really pops. It does wonders to break up what would be a plain silver finish. I may have been imagining things as I applied this but I thought I saw a little bit of turquoise glitter in there too. 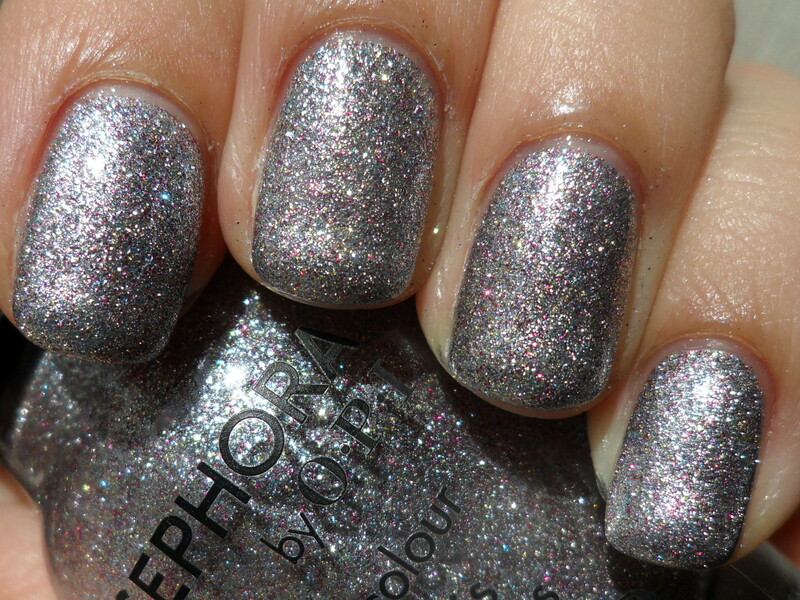 Despite the polish being all-glitter, the sparkle factor is delicate; it looks amazing in the sun. I paired this with Sephora by OPI Just a Little Dangerous on my toes. Picture taken in natural light. (Click to see it less blurry in full-size.) The formula was smooth and pigmented; I got full, even coverage in two coats, over two coats of basecoat. Although it doesn’t necessarily go with my skintone, I really like silver nail polish; often times I prefer it over gold. 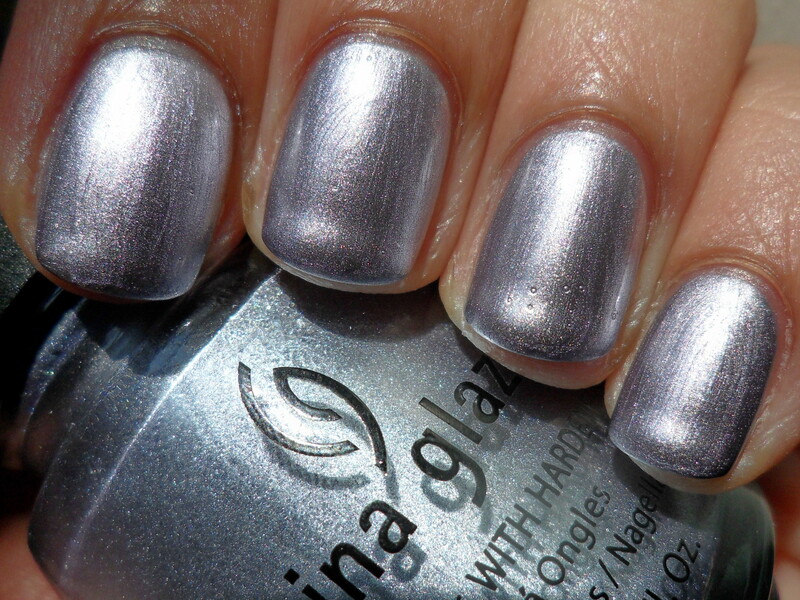 I love this shade; true silver can look so bright! This has a really futuristic vibe to it. 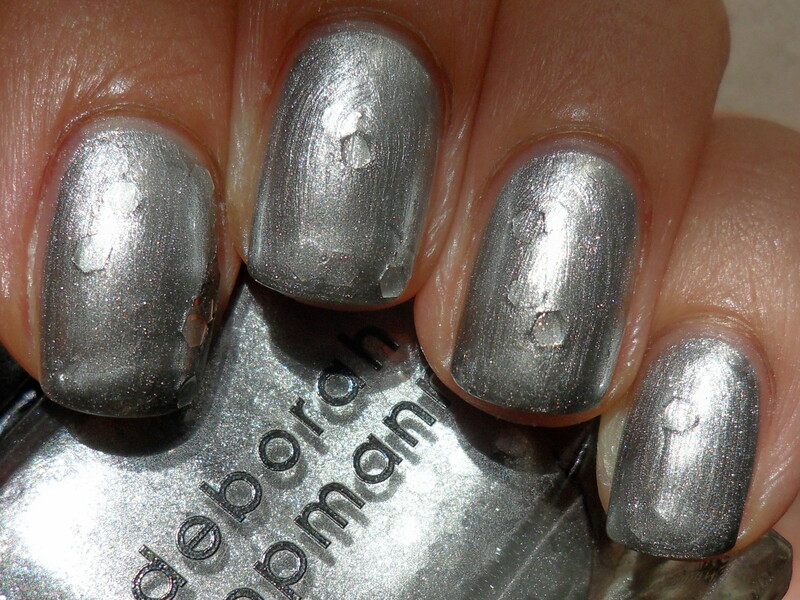 At a quick glance this does look like molten silver on the nail. I hardly wear any jewelry so with this type of polish on I kind of feel like I am. I’m glad to have finally tried this collection! Since the formula shows every flaw on the nail, I wanted to wait for my nails to be free of any ridges and dents. I wasn’t too keen on the formula at first, but after finding the right techniques to make it work without excessive bubbles and brushstrokes, I totally came around. I particularly love the last three I tried. I still prefer the foil-type metallics, for the sparkly factor, but it’s great how the very fine shimmer in this keeps the finish from looking frosty, while still preserving the look of a “regular” metallic finish. I paired this with OPI Russian Navy Suede with topcoat on my toes. Picture taken in sunlight. The formula was smooth and pigmented, giving full coverage in two coats. The double-layered basecoat method I’ve been using seems to be doing the trick; I get less bubbles with each polish I try from this collection. Any visible bubbles I get now are from the topcoat. I don’t like topcoat bubbles either, but I can tolerate them much more than bubbles from the polish itself (plus, topcoat makes polish bubbles disappear :)). This doesn’t look purple enough for me to call it lavender; it still falls under the silver category. At a quick glance this may look like a plain silver, but when compared side-by-side to a true silver you can clearly see it’s not. 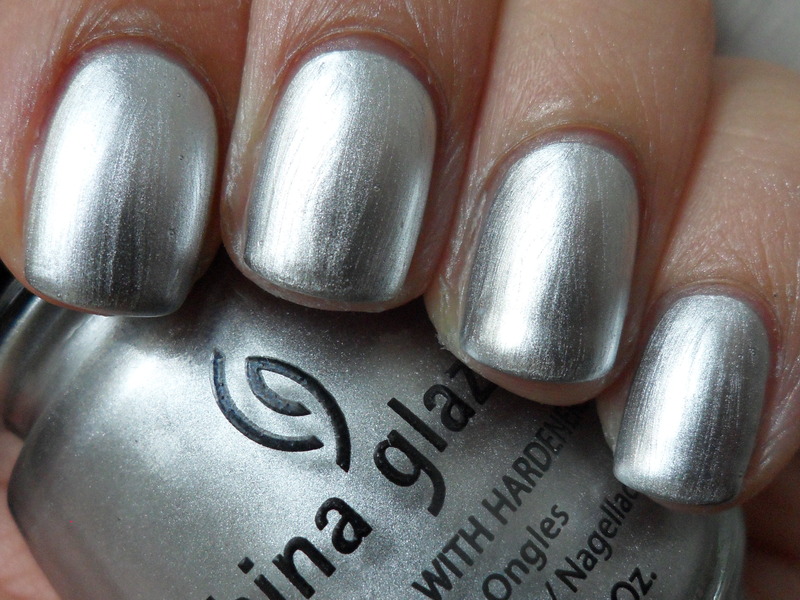 This is also a shade darker than your standard silver. I think the lavender tint may come from the shimmer. I love it; whenever I see a metallic polish that’s lavendery and silver I just automatically think “spacey.” It kind of reminds me of that silvery purple/green duochrome color combination. I paired this with Suzi Skis in the Pyrenees Suede with topcoat on my toes. Picture taken in sunlight. It’s been a couple of months since I’ve even worn a glitter like this, so I had to get reacquainted with this type of formula. I put down a relatively sheer first coat for the additional coats to hold on to, then I added two more coats. The formula can get thicker as you work with the polish, but it’s not difficult to work with. I don’t mind having it not completely glassy smooth, so I only used one coat of Poshe (this alone already makes for a very thick mani so I can’t imagine adding more layers of topcoat.) It’s probably because I haven’t worn a glitterbomb in a while, but I can’t stop looking at my nails! 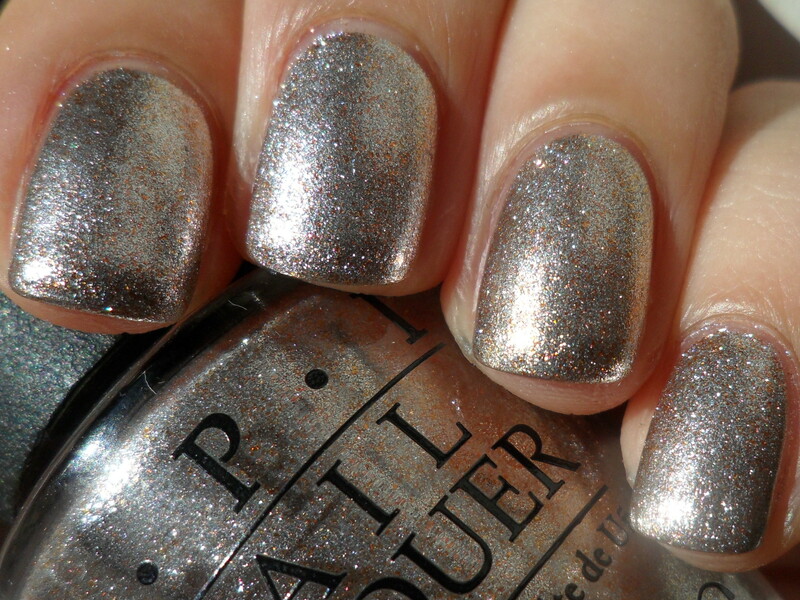 This polish is gorgeous and sparkly like diamonds. 🙂 I really can’t help making the association; it does look ornate and glamorous. 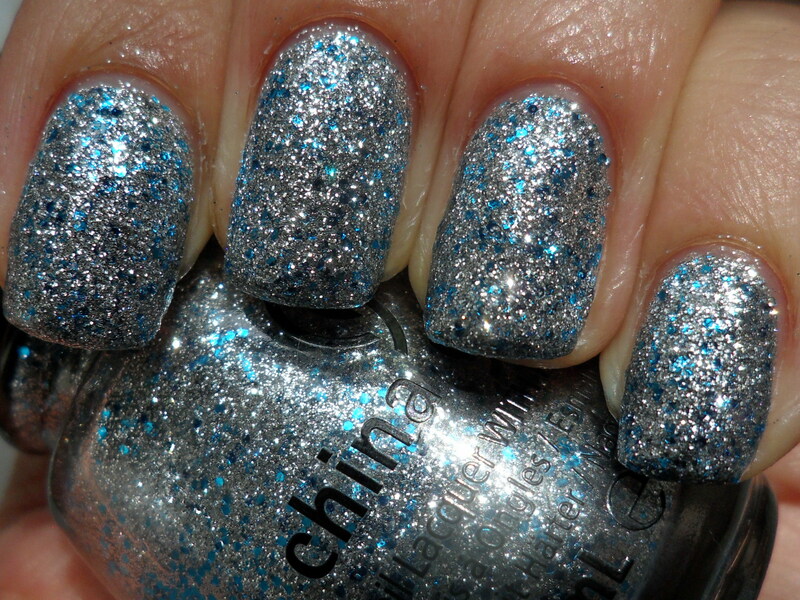 I love the pops of blue glitter, it breaks up the plain silver, giving the finish a unique and more dimensional look. I paired this with China Glaze Dorothy Who? on my toes. Picture taken in sunlight. This applied well; the formula was pretty sheer so I needed three coats to build to opacity. This has a metallic finish so the brushstrokes come with the territory, but it’s shimmery so it doesn’t look terribly frosty. Plus, there are some bits of microglitter that are perfectly incorporated into the mix, masking the brushstrokes even further and providing an extra twinkle. I tried to pick a photo that showed both the green and purple elements of the polish, but the strong duochrome effect is best seen in real life. The silvery lavender is what you see when you look at your nails straight on, then the color changes to the silvery seafoam green as you tilt your nails upward. The seafoam green makes me think of the ocean, but the silvery-lavender aspect gives me an intergalactic vibe, so it all makes me think of…space mermaids? I paired this with OPI Have You Seen My Limo? on my toes.